Chad Pipkens gets his first Top Ten of the 2017 Bassmaster season during stop #1 of both the Northern Opens and the Northern swing of the tournament season! 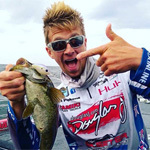 Chad Pipkens is sightfishing on day 2 of the Palatka, Florida Bassmaster Elite Series tournament on the St. Johns River, and gets excited to see the bass is hooked inside the mouth as required by Elite Series rules! With 20 minutes to go on day 1 of the St. Johns River Bassmaster Elite Series tournament, in a heavy rainfall, Chad Pipkens puts a giant 7 pound 11 ounce Florida largemouth bass into the livewell! Eve more Elite Series bass fishing action from Chad Pipkens 3rd place finish during the 2015 Chesapeake Bay Bassmaster tournament! More Elite Series bass tournament fishing action from Chad Pipkens top five finish during the 2015 Chesapeake Bay Bassmaster tournament! 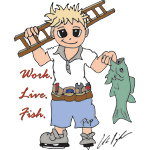 Chad Pipkens just completed competing in his 2nd consecutive Bassmaster Classic March 4-6, 2016 in Tulsa Oklahoma on Grand Lake O’ The Cherokees. 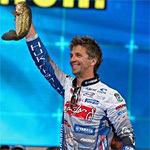 Now Pip is more determined than ever to make the next Bassmaster Classic too, so on to the 2016 Elite Series. Chad Pipkens turns up the heat on days 1 and 2 of the Bassmaster Toyota Angler of the Year Championship heading for a 5th place finish, 6 straight finish in the money and a Bassmaster Classic 2016 berth! Elite Angler Chad Pipkens tore it up to finish the 2015 Bassmaster Elite Series season including his 3rd place finish at the tough Chesapeake Bay tournament! 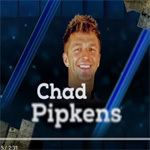 Chad Pipkens caps a smoking hot run to end the 2015 Elite Series season with his 2nd consecutive Bassmaster Classic berth! 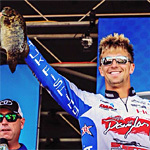 Three top fives in a row, and four top tens vaulted Pipkens into 27th place in Bassmaster Angler of the Year points! 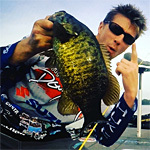 Probably punching his 2nd consecutive Bassmaster Classic invitation, Elite Angler Chad Pipkens moved up to 28th place in Toyota Bassmaster AOY points with 5 Sturgeon Bay bass weighing 16-3! Chad Pipkens has already finished in the money in his last 5 Elite Series events with a 4th and a 3rd at Chesapeake Bay and Lake St. Clair. Pip is still on fire bringing in 18-1 on day 1 on Sturgeon Bay! 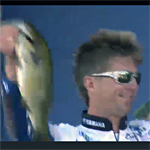 From August 19, 2015, Elite Angler Chad Pipkens gets fired up over a big bass on Chesapeake Bay in this video from Bassmaster LIVE!